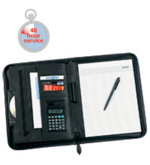 Our unique Calculator folder with logo is an A4 zipround black folder with grey trim. A calculator is fitted inside, together with a range of pockets (one is zipped) for business papers. There is an additional feature of a clear business-card-sized window pocket. Pad and pen included. So have your companies details and logo branded onto our Calculator folder with logo today! Other promotional and personalised items besides our Calculator folder with logo click here. To find out more about our Calculator folder with logo click here and fill in the contact form and we'll get straight back to you.